Fast Treatment. Focused Dose. Revolutionary Technology. Brainlab announced 510(k) clearance for Automatic Brain Metastasis Planning, bringing to market technology that consistently and rapidly generates radiosurgery plans for the efficient treatment of multiple metastases.With this breakthrough software, you can now plan and treat multiple brain metastases with time and dose efficiencies while helping to minimize exposure to healthy surrounding tissue. Treatment delivery and planning time can be reduced drastically, even for as many as 10 metastatic tumors in the brain.• Offers automatic prescription selection based on tumor volume criteria • Different treatment options are possible based on a clinical paradigm selection—from single fraction radiosurgery to fractionated SRS or SRT • Automatically selects a group of metastases, but has the ability to unselect metastases that should not be treated under the automated single isocenter (i.e. 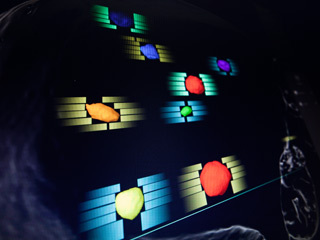 easy clustering of regional subgroups)Automatic Brain Metastasis Planning pairs seamlessly with Brainlab Element SmartBrush, intelligent computer-assisted tumor outlining.